Fear and Loathing is everything you would expect from a drug fuelled trip to Las Vegas – and more. Filled with bizarre situations, hilarious dialogue and a unique writing style, this book was enjoyable to read from beginning to end. Hunter S. Thompson is a brilliant writer who manages to describe his days spent in Las Vegas with a surprising amount of clarity and lots of humour. Set in the post hippie era, this cult hit is loosely based on some of his own actions, mixed in with some imaginative, fabricated events. 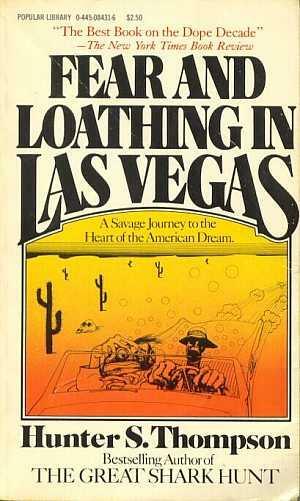 The book opens with him and his attorney thundering through the desert on the way to Las Vegas in ‘The Red Shark’. Being a sports journalist, Thompson has been given an assignment to cover a desert motor race in Las Vegas. Instead, he takes the spending money and stocks a rented red chevy convertible up with every type of drug imaginable, and along with his Samoan friend, goes in search of the American Dream. Before they even reach Las Vegas, they are already completely off their heads, as the very first sentence says, ‘We were somewhere around Barstow on the edge of the desert when the drugs began to take hold’. The perfect opening line for this book, There is no build up, we are just shoved right in at the deep end of their crazy, twisted journey. From that moment we are swept off on a roller coaster of a ride, which takes us to smashed up hotel rooms, bars full of hallucinated creatures and paranoid trips through the desert. There are many laugh out loud moments from Thompson’s drug induced paranoia. However, it isn’t a book which you have to be under the influence to enjoy. Since its publication, this rambling, fast paced narrative has been hailed as a modern classic and an important literary piece, introducing the unique writing style, known as Gonzo journalism. I have never read anything quite like it. Give this book a go! Click on the picture below to buy it. I’ve been meaning to read this for a while. I saw the movie version and really enjoyed it.